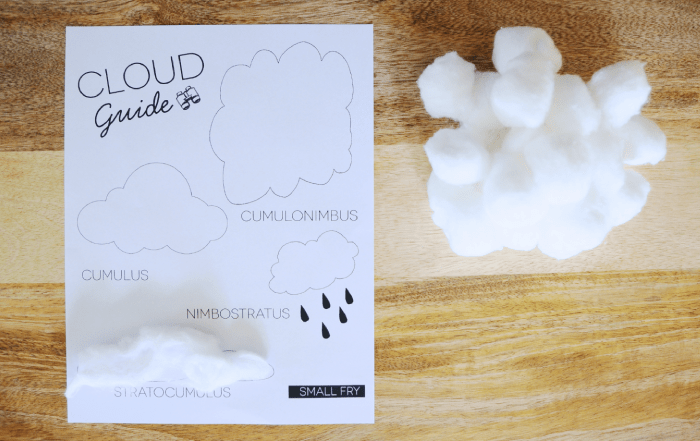 Cumulus // The “fair weather” cloud. Puffy cotton ball looking clouds, sometimes with flat bottoms, these clouds are a good sign! Cumulonimbus // A vertically built cloud that usually brings lighting, storms and snow blizzards in the Winter! Nimbostratus // The rain cloud! Gray and and cotton candy like, this one carries rain wherever it goes. Stratocumulus // Another dark grey cloud that travels in bunches. It usually comes at the beginning of a storm and is the “sprinkle” cloud, where you’ll only feel little droplets of water. For this project we simply gathered a bowl of cotton balls and stretched them out be able to manipulate them. Then using Elmer’s glue we had the boys attach them to the clouds on the download. The next time we play the “What do you see in the clouds?” game we’ll let you know if the usual “Elephant! Dragon!” responses are switched for a more accurate “Cumulus! Nimbostratus!” One can dream. Love this. Totally going to do it this afternoon with Parker. Thanks! Cute! This reminds me of montessori style, which I love. Brilliant! This is right up my little brainiacs alley.